A zillion new smartphones are going to be announced soon at Mobile World Congress, each promising camera advancements that may or may not live up to the hype. Before we get there, though, we wanted to take stock of how good the cameras are in the smartphones you can buy now. Here's how the flagships measure up. For this battle we ran five top-end smartphones through a gauntlet of tests to see what's working and what's not. We focused our efforts on the Apple iPhone 5, Nokia Lumia 920, Samsung Galaxy S III, Google Nexus 4, and the newly announced Blackberry Z10. Following our last big smartphone camera battle in the fall, we were convinced of two things. First, that the Nokia 808 PureView is better than anything else, but you're never going to buy a Symbian phone. Second, HTC's flagships come with rubbish cameras. So we didn't bother with those this time around. We tested each of the camera's abilities under a few of the most common situations, making sure each photo was taken in an equal, controlled environment, and taking care that the photos were taken from the same location, and with the same focal point. For each shot we needed we took a few and selected the best from the batch to control for anomalies in camera performance. You can see each of the images in their uncropped glory at the very bottom of this post. First, we recreated the quick camera test we did for the BlackBerry Z10 a few weeks back, but under the most precise conditions possible. In very dark conditions with no flash, the Lumia 920 takes the best photos. As you can see above, the Lumia's optical image stabilization helps the camera achieve a passable photo even under the toughest circumstances. There's no graininess, and the statue is more or less properly exposed despite the lack of light. The iPhone also picked up decent light, but the photo is a noisy horrorshow. The rest of the phones perform within reach of one another, with the Nexus 4 being the worst of the bunch. The Z10 did better this time around than the last, but still fell short of the frontrunners. You should avoid using your flash under any circumstances, but we know that most people are going to deploy it sometimes, anyway. So we took the same photo above, except with flash to see if any of them could illuminate the scene without ruining the photo. 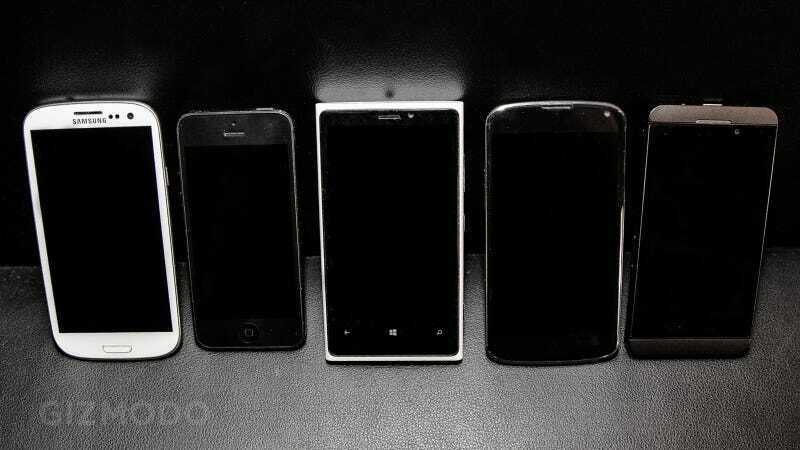 The Z10's "hard" flash really shined in this test. The photo above is accurately exposed, and the details are crisp and sharp. The Lumia 920 comes in a close second with an accurate exposure, slightly softer flash, and less noise. Softer light is preferable when photographing people, but the harder flash of the Z10 is great for objects. The Galaxy S III's flash performance is borderline decent, while the iPhone and Nexus fail the test for blowing out the details of our collectible friend. Based on our Instagram feeds, least 93-percent of smartphone photos are of beautiful skies during the day. Because the sun is such a lovely source of light, most cameras should perform reasonably well in this situation. In this test, we were looking for the camera that evenly exposed highlights and shadows throughout the image. We also wanted to make sure a camera could shoot during the day without catching lens flare. The Lumia accomplishes both of these the best. In the image above, you can see there's even exposure on the building and sky. The camera's wide-angle lens provides a great field of view and it has no problem resolving the sun without creating an awful lens flare. The iPhone 5 is a close second, with even exposure a slight flare washing out the contrast of the image. The GSIII handles the sun well but the image looks unnatural owing to the excessive contrast and saturation. As with the flash test, the Z10's photo has the sharpest details, but the lens doesn't handle the sun well, and a flare washes the image out quite a bit. The Nexus 4 is dead last, with a horrible lens flare and completely washed out exposure. Finally, we did a little indoor portraiture with our friend Lindsey Jaffe from the Gawker Ad Sales team—just to remove the battle from the level of complete abstraction. The idea here is to see which camera could handle color balance to really capture the proper skin tone hues when shooting a person. We shot Lindsey against a white background so that the camera had a clear reference point for white balance perfection. Failure under these circumstances is inexcusable. The Galaxy S III did the best at representing accurate colors in this situation with a very clear and color correct image. The Lumia came out a little on the blue side but still very accurate with a healthy level of contrast. The iPhone balanced more to a yellow-pink color and the image came out foggy. The Z10 shows up blurry and a little on the yellow/pink side in its color balance, which is odd because in our other tests it captured the sharpest details. The Nexus 4 once again underperforms by a large margin with a washed out, blurry image with a very pinkish-yellow color tone. Winner - Nokia Lumia 920: Using only the automatic setting, it gets an accurate exposure and decent image in all shooting conditions. You can't beat it. Second Place - iPhone 5 It's not the best at any one thing, but the iPhone 5 performs reasonably well in most settings, but the flash makes photos a total mess. Third Place - BlackBerry Z10: The Z10's details are beautifully sharp, which is a refreshing reminder that smartphones don't always have to shoot the fuzzy, soft photos we're used to. Still, the camera underperforms in terms of overall image quality—especially in low-light—compared to the field. Fifth Place - Nexus 4:. For being Google's flagship Android device, the Nexus 4 is incredibly disappointing. Its camera is terrible even under optimal conditions. You have to cut corners somewhere to hit a low price point, and Google obviously skimped on the camera.